It's no secret that I'm a fan of a good romantic suspense novel that grabs me from the beginning and won't let go. 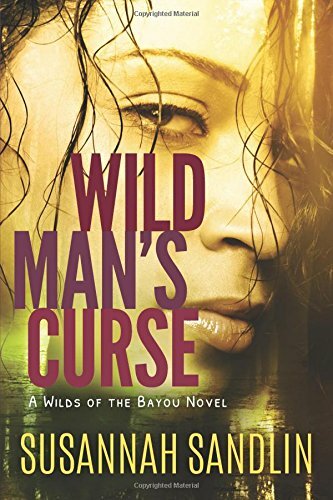 The first two books in Susannah Sandlin's Wilds of the Bayou series have both kept me reading way past midnight, eagerly turning pages through the twists and turns of her meticulously-plotted, action-packed, can't-wait-to-find-out-what-happens-next stories. If you haven't read them yet, I highly recommend starting with Wild Man's Curse (read my review here) then diving straight into her October 18th release, Black Diamond. I can't wait for her next visit to the Louisiana bayou to find out what happens next! Find more information about Susannah Sandlin (who also writes as Suzanne Johnson) at her website and connect with her online at Facebook, Twitter, and Pinterest. Welcome, Susannah! 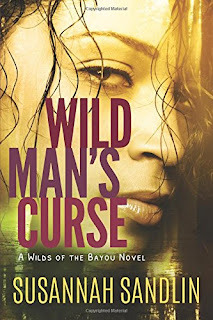 I’m addicted to your new suspense-filled Wilds of the Bayou series. What was your inspiration for these books? 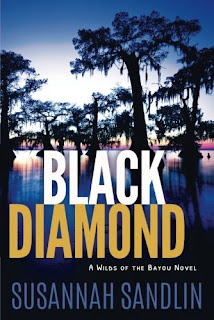 The second book in the series, Black Diamond releases October 18 and, as with Wild Man’s Curse, had me riveted to the story from beginning to end. What should readers expect from this book? I was in Cole’s and Jena’s cheering section from the moment they met. Will we see more of them in future books in this series? Absolutely! Because Cole and Jena have a lot of painful history to overcome, I didn’t want to push their romance as quickly as I normally might. So they will get some catch-up time in a future book. I always like to keep readers up to date on previous series characters. You have a terrific secondary cast of characters in these books. I haven’t seen nearly enough of Jena’s temporary partner, Mac or senior agent, Paul Billiot. Do you have stories planned for either – or both – of these characters? I have books planned for both Mac and Paul. Originally, I had planned for the next book to be Mac’s, but Paul keeps nagging me. He has a story and keeps whispering bits of it to me when I’m not expecting it. (Yes, stuff like that really happens—LOL.) So the next Wilds of the Bayou book will see our stern, obsessively neat Native American agent Paul Billiot finally meet his romantic match. You excel at creating a sense of place in these books as well as creating characters who are complex and authentic – from gator hunters to game wardens to drug addicts to PTSD recluses. What kind of research was required for this series? I’m an obsessive researcher. I came up with the idea of building a series around wildlife agents (i.e., game wardens) after Hurricane Katrina. I was living in New Orleans at the time, and LDWF agents were first on the scene, plucking people out of the floodwaters. I didn’t know until then that wildlife enforcement agents are the state’s first responders in search and rescue, but it makes sense because Louisiana has so many waterways, swamps, and marshes. So I read biographies of game wardens, learned about their training and structure, talked to law enforcement officers from South Louisiana, subscribed to a survivalist magazine to see how far I could take my hero off-grid, visited some South Louisiana marshes….I want my readers to feel as if they’re really in the story! And, of course, I spent much of my adult life on that stretch of I-10 between Houston and New Orleans. Your descriptions of the gators in this book remind me of why I don’t spend a lot of time in gator-infested waters. Have you traveled the waterways of the bayous? Ever had an up close and personal encounter with a gator? I find alligators fascinating! They have been around for more than 180 million years, making them contemporaries of dinosaurs…except they’re still here. (When we’re all gone, I’m convinced only cockroaches and alligators will survive.) I do have a healthy respect for them, however, so I have only traveled the bayous as a tourist. My up-close experience with alligators has come through friends—there are two herpetologists in my local writing group, both of whom have worked extensively with alligators—one even has the scars to prove it! So they’re my go-to sources for things like how long it might take a gator to digest something and how fast gators can move in the cold waters of early spring. I did stump them by asking how an alligator might react to a hallucinogenic drug, though. Your bio says you’re a longtime resident of New Orleans. What are your three favorite things about living in southern Louisiana? I had to move away from NOLA for family reasons a few years ago, but I’m pondering my return. I love the eccentricity of the place—people accept others for who they are, and every time you leave the house you can’t predict who or what you might see. I love the architecture, the history, and the marshes and swamps. The sound of ships’ horns echoing on the river. And did I mention the food? South Louisiana is the home of my heart, and always will be, no matter where I live. Definitely! I’d love to see both Paul and Mac’s books in the Wilds of the Bayou series out next year, as well as beginning a new suspense series I’m working on. I’ll be transitioning out of the day job next spring so I’ll be able to devote myself wholly to writing. Thank you for visiting with me, Susannah! Would you like to ask our readers a question? Thanks so much for having me! Here’s something I always want to ask readers. Do you like a “slow burn” in your romantic suspense, or would you prefer to see the hero and heroine make their commitment early on? I would prefer seeing them make their commitment early on. Black Diamond next week, YES. Thanks, Roger! I always worry about "insta-love," but in romantic suspense you have to get it in pretty early. I pushed it about as late as I could in this one because the characters have so much "baggage." A slow burn is okay if the couple is part of a series, but in a single novel I want to see the commitment early. Can't wait to read Black Diamond! Thanks, Liz--I hope you enjoy Jena and Cole's story! Thanks for visiting with us today, Susannah! I'm one who enjoys a slow burn if done well and appropriate to the characters and story. In Black Diamond, an early commitment would have been totally wrong for both Jena and Cole. For me, the slow burn was exactly right for who they were and what they had endured. Slow burn, as long as the commitment is not at the very end of the story. Whatever suits the story. Don't want it just for the sake of getting it in there. I enjoy romantic suspense and the not knowing! I think you're right--it really depends on the characters and what' works with the suspense storyline and the characters' personalities. The not knowing is fun! I like the slow burn. Just makes the final connection more combustible. This sounds like my kind of series. Thanks PJ for the introduction to Ms. Sandlin. Off to one-click. Thanks, TrishJ--I hope you enjoy the read! I like the "slow burn" in my stories. I have never read any of Susannah's books. But I will definitely look forward to reading her stories. Thanks, Janice--hope you get a chance to check out my books! It was fun to have Cole and Jena forced to work as a team--it accelerated their slow burn!